All prices in USD excl. VAT and shipping costs. Worldwide shipment. The following demo-kits are available. They come with full SDK on CD-ROM. Prices in USD excl. VAT and shipping costs. Worldwide shipment. contains 1 USB SG-Lock® U2, U3 or U4. 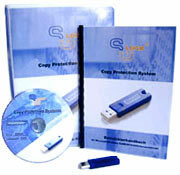 contains 1 USB and 1 LPT SG-Lock® U3/L3 or U4L4.